(c) the assured tenancy on which the dwelling-house is let did not come into being by virtue of any provision of Schedule 1 to the Rent Act 1977, as amended by Part I of Schedule 4 to this Act or, as the case may be, section 4 of the Rent (Agriculture) Act 1976, as amended by Part II of that Schedule. For the purposes of this ground, if, immediately before the grant of the tenancy, the tenant to whom it was granted or, if it was granted to joint tenants, any of them was the tenant or one of the joint tenants of the dwelling-house concerned under an earlier assured tenancy or, as the case may be, under a tenancy to which Schedule 10 to the Local Government and Housing Act 1989 applied], any reference in paragraph (b) above to the grant of the tenancy is a reference to the grant of that earlier assured tenancy or, as the case may be, to the grant of the tenancy to which the said Schedule 10 applied. For the purposes of this ground “registered social landlord” has the same meaning as in the Housing Act 1985 (see section 5(4) and (5) of that Act) and “charitable housing trust” means a housing trust, within the meaning of the Housing Associations Act 1985, which is a charity, within the meaning of the Charities Act 1993. 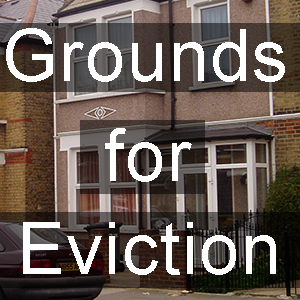 Right, we are outside of the first 5 grounds so no pre-notice required for this but it is still a mandatory ground for eviction if it can be proven to the court’s satisfaction. In other words, it is a genuine set of major works. There must be a ‘genuine desire’ for the works to be carried out and a ‘reasonable prospect’ of the works being conducted. A tenant can complain about the inconvenience of major works but that is a different ballgame to gaining possession in order to do it because there is no alternative. Bearing in mind that the tenant will lose their home over this, the courts will take this seriously. It isn’t about rights of access to do the works. Remember Section 11 of the Landlord and Tenant Act 1985 gives the landlord right of access to carry out repairs. This isn’t the same thing. A landlord will have to show the court that the proposed works are immanent, not that they simply want possession of the property and will then figure out how and when to do the works at a later date. So you can’t buy a property with the intention of demolishing it and rebuilding and then use ground 6 to evict the little old lady who refuses to move out. Finally, if the ground is made out, the landlord must pay the tenant’s reasonable removal expenses. Housing advocates should look at the genuine requirement to demolish or reconstruct. One good starting point is council served notices or planning permission approval or an application that is likely to succeed. Check the immanence of the proposed works. In the case of Edwards v. Thompson (1990) the landlord had not engaged a construction company to do the works and could not at the hearing provide proof that they could pay for the works. Its that level of detail you are looking at with this ground. Its that level of detail you are looking at with this ground. What would happen if an HMO landlord wished to build an extension onto the back of a property, the works involving carving up the kitchen at some point but probably leaving the upstairs intact (including the bathroom)? If the tenants insisted they would be happy to stay and would work around the temporary loss of use of full kitchen facilities (e.g. cooking on a hob in their room) would the Court allow them to do this? If moving is forced, what about compensation for relocation expenses? In some boroughs the Council operate a landlord licensing scheme, including two-storey HMOs. If the LL had not registered and meanwhile the owner/LL applies for planning permission to do the works, will the Council be under an obligation to consider that the house is an HMO and will the landlord’s unlicensed status jeopardise his application, should it come to light before the application is approved. What about if the application is approved and only later does the Council become aware of the HMO and it’s unregistered status? Can planning permission be revoked retrospectively? Also, would the Council pay any attention to the tenants objecting to the planning application?